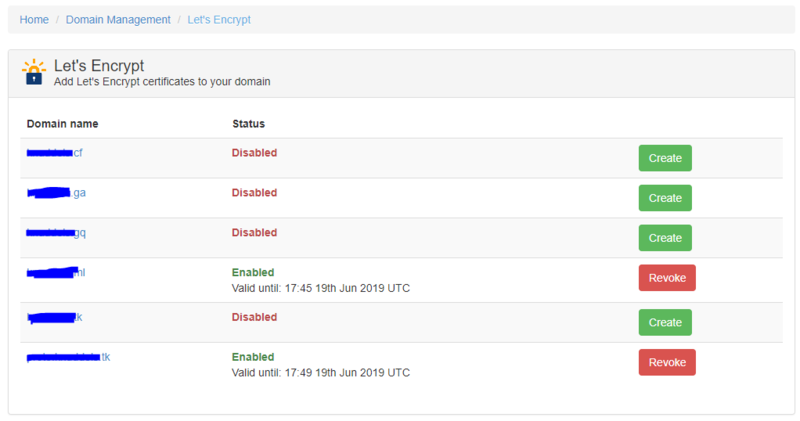 today i had written a Let's Encrypt module, because it's currently no others available. Wow - this looks incredible! Did you write this from scratch or is it based on a previous attempt to incorporate Let's Encrypt with Sentora? Only a Helper-Class (ACMECert) is used (Source: https://github.com/skoerfgen/ACMECert), all other is selfwritten. (03-22-2019, 07:14 AM)Bizarrus Wrote: Only a Helper-Class (ACMECert) is used (Source: https://github.com/skoerfgen/ACMECert), all other is selfwritten. Seems to work exactly as expected! What about renewals - are these taken care of through a cron job built into the module, or is another mechanism taking care of it? Or will it have to be done manually by the user? Normally im using the latest Certbot release from GitHub. But the restrictions of permissions makes it hart to interact with Shell-Scripts, thats why im using an simple (but effective) Web-API. The renewal process will be added to the default cron, that was my first things. I hope the module will work on most users with older PHP versions, i had seen, that on CentOS, PHP 5.6 will be installed and on Debian is PHP 5.4 presented. But my code style is a little bit newer (For sample  as Arrays instead of array()). On further releases, Wildcards will be implemented with an direct interaction of DNS. The ACME-Challenges will be stored as TXT record and i will try to check out if it possible to interact here with post processesif the DNS records are published. (03-22-2019, 02:40 PM)Bizarrus Wrote: Normally im using the latest Certbot release from GitHub. But the restrictions of permissions makes it hart to interact with Shell-Scripts, thats why im using an simple (but effective) Web-API. Yes I know, there does not appear to be much of a push to keep Sentora up-to-date but I try to keep the versions I run on my own servers up-to-date. I am running my Sentora servers with PHP 7.3 and can confirm that the module you have created seems perfectly happy with this version of PHP so far. and it seems to work correctly. Just to clarify, is the cron renewal something that is already implemented, or something that you have not yet added in? Looking at the code in LetsEncrypt.php more closely, there seems to be an issue with adding the www to domains. in the SSL certificate, even though Sentora listens for this. The renewal cron is currently not developed, this part will be created today. The Issue with www. Domains is a mistake, yep! I had only test simple TLDs like de, com and other, but not extended TLDs like co.uk. I will fix that bad behavior in 1 hour. And no, i cant check if the domain has an "www." at the start point. The www. Entry is only for Domain names whithout subdomains like example.com. Here, by default, the www. Entry will appears. I've written now an TLD-HelperClass for some extended domain names. Here i'm using the public TLD-List from https://publicsuffix.org/list/public_suffix_list.dat. I will commit the new version, if i had implemented the renewing process. (03-22-2019, 08:25 PM)Bizarrus Wrote: I've written now an TLD-HelperClass for some extended domain names. As Sentora already separates domains from subdomains, surely the above conditional that I suggested could be applied to only domains (and not any subdomains)? Sentora will always add a www alias to any domains added to the system, so why not just follow this behaviour and keep it simple?